mwe3: Ross, Adored is a great new album from you. How soon was it recorded after the Ambience, Antiquite And Other Love Songs album and how did the Adored music and CD release take shape? Whats been the reaction so far? 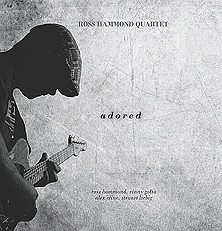 ROSS HAMMOND: Ambience, Antiquite and Other Love Songs was mostly recorded from a live show in November of 2010. I think Adored was recorded about a year later in December of 2011. Musically my approach to making the records was similar. I wanted to use some themes from lullabies (Adored, Shes My Little Girl, etc) and turn them into some launchpads that a group could use for improvising. The difference was mainly that the Adored record had some incredible improvisers on it whereas Ambience... was a solo guitar effort. After I finished recording and mixing the songs it was pretty easy to get some CDs made and do a release. We had our CD release show in February and the reaction has been great. The record got some great reviews from the Downtown Music Gallery (NYC), Allaboutjazz.com, Something Else!, free-jazz steffs blog as well as some good airplay from jazz and improv radio. Im pretty amazed at the attention the disc has received. Something Else! ranked it as one of the top jazz releases of the year. Im not sure if thats true, but its nice to get the nod. mwe3: Where and when was Adored recorded and can you describe the chemistry between you and the players involved? The album is so well recorded it sounds like its some kind of avant prog supergroup. What did you set out to achieve with the new album and how does Adored differ compared to your other album releases? RH: We recorded Adored in Los Angeles last December at Wayne Peets Killzone Studio. 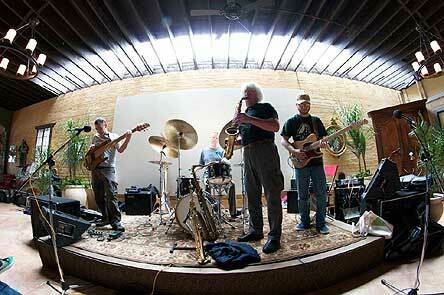 The session was pretty easy, as the guys in the group are pretty amazing improvisers. I just laid out a direction and showed them the themes of the songs and that was it. The group took care of the rest. Ive been playing with Vinny, Steuart and Alex at different times for a couple of years now and wanted to document that group. Its kind of funny to me because the songs by themselves are fairly easy with very singable themes, etc. Theres not a lot of complexity in this batch, but I really think thats what makes the music happen. The songs are simple but we can make them as complex and dynamic as we choose to. As for the difference between the other albums, I think its pretty apparent how my songs have changed since becoming a dad. The music feels more folky in terms of how Im writing. Most of these songs were based on songs I sing to my daughter at naptime or on a walk or something like that. You have a continuous muse as a parent, and I think thats been the source of my songs. 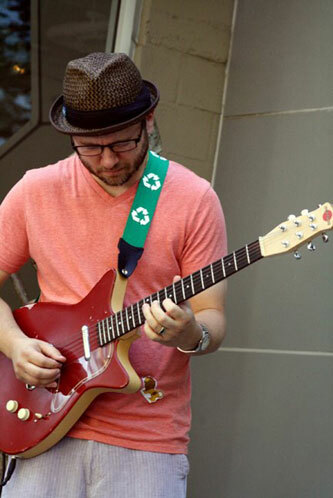 mwe3: The last time we spoke you told mwe3.com about your guitars including the red Danelectro reissue and the Fischer archtop. So what guitars, amps and other gear did you feature on the Adored album? RH: Well, the Adored recording session was fun for me because I was fairly limited in what I wanted to travel with to do the session. I didnt take a lot of guitars, pedals, amps, etc. We micd up my ZT Lunchbox and I plugged in the red Dano and tracked the whole thing like that. The Distortion pedal I used on a couple of tracks was a Zvex Vextron, and the delay pedal/looper was a Digitech Hardwire DL-8. I think I had a Chiklet reverb pedal too, and thats it. Most of the sounds on that record are Dano-reverb-Lunchbox and Im pretty happy with how the guitar sounds. That being said, as much as I like the Danelectro guitars I recently upgraded to a Jerry Jones Neptune. Its the same kind of vibe but its just a nicer instrument all around. I think Ive used that for almost every gig since I purchased it in the Springtime. That and the Fischer archtop are my main guitars, and for acoustic stuff Ill use a 61 Martin 00-18 or a Hernandes 12-string tuned CGCFGC. But as with anything, there are always instruments coming in and out of the house. When a gig calls, my immediate response is Jerry Jones guitar, Lunchbox amp and Im out the door. mwe3: What are you hoping listeners will come away with after listening to the Adored album and how about future plans moving forward through 2012 and now looking at 2012? RH: Well, it really is a nice thing to get some attention for the music one makes. I think that this record really succeeds in taking the spiritual, free-jazz/group-improvising music that I love and combining it with simple, folk songs and themes. Thats pretty much what it is, and I think that there arent a lot of records being made like that. Its been compared to Sonny Sharrocks Ask the Ages, which I love but Im not ready to compare my music to his. If others say that, then great. As for the present and future state of the music, Im involved in a few new projects. Vinny and I are going to be recording a trio with bassist Adam Lane in NYC in the fall, which should be a lot of fun. 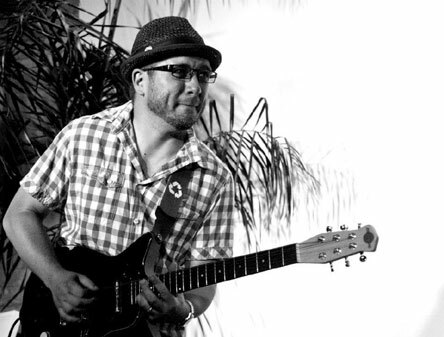 Also, I have a new trio in Sacramento called Revival Trio with Vanessa Cruz (drums) and Shawn Hale (bass). Its in the jazz tradition, but were doing a lot of hybrids of jazz, African Music, folk songs, etc. Were recording in August in Sacramento.